Seldom seen in the wild, the Snow Leopard is an endangered animal who is a close cousin to the more common, Leopard. Most of the year they prefer habitats where there is a combination of mountain regions with high altitudes and coniferous forest such as the Himalayas. When summer months arrive they prefer to be near grassy meadows. The majority of the Snow Leopards live in China, but they can also be found in 11 other countries throughout Asia. Listed in the facts and information below you will find out why this beautiful creature in endangered and what the main threats are to the Snow Leopard population. This information is written for kids and adults. Click here for a great selection of Amazon.com books about Snow Leopards. The Snow Leopard has many adaptations for living in such a cold environment. The paws are completely covered in fur, the long furry tails wrap around the Snow Leopards body for warmth, and the wooly body fur helps insulate Snow Leopards from the cold. 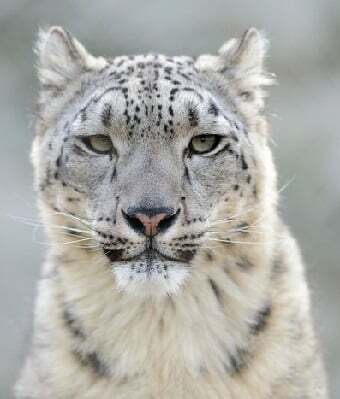 Snow Leopards can be found in not only China but also India, Afghanistan, Russia, Bhutan, Uzbekistan, Nepal, Pakistan, Tajikistan, Kyrgyzstan, Kazakhstan, and some areas of Mongolia. The black and brown spots mixed with a dark streak down the leopard's back make it easily recognizable. It also features a thick off-white or sometimes grey coat. This coloring helps to keep it hidden from potential prey until the leopard is ready to pounce. Because of their speed and agility, Snow Leopards can hunt animals three times their size. They hunt a variety of larger animals including goats, wild sheep, gazelles, deer, and wild boar as well as smaller animals like hares, mice, and birds. The average lifespan of a Snow Leopard is approximately 15 years. It can be a few years longer, on average, in captivity. Snow Leopards can leap over 40 feet in a single pounce. This is further than any other member of the cat family. Snow Leopards are nocturnal animals and are especially active at dawn and dusk. The Snow Leopard differs from other cat family species in that they are not able to roar and they have light green or light grey eyes as opposed to yellow or gold. The snow leopard is listed as a threatened species by the IUCN. The International Union for Conservation of Nature (IUCN) is the worlds largest organization dedicated to the conservation of endangered species. The biggest threat to Snow Leopards is humans. It is illegal to hunt Snow Leopards but demand for their fur is so strong that they are hunted illegally. Deforestation and other human projects are eradicating the Snow Leopards habitat and food source. It is estimated that there are only 3,500 to 7,000 Snow Leopards living in the wild and approximately 650 of them living in captivity. Breeding season, from January-May, is the only time that Snow Leopards will pair with other Snow Leopards. They lead a solitary existence the rest of the year. The mother leopard will line a den with her own fur to keep her young warm. Litter size is usually 2-3 cubs each spring with a gestation period lasting 98-103 days. Cubs will begin hunting with their mother at just 3 months of age and will remain under her protection through the first winter of their life.